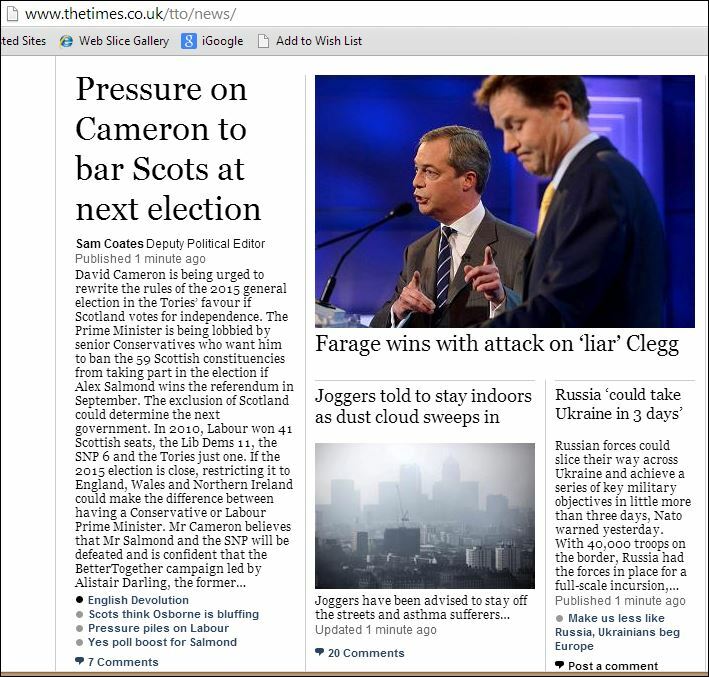 So according to the front page of The Times tomorrow (April 3rd), David Cameron is facing pressure from ‘Senior Conservatives’ to ban Scots from voting in the 2015 general election if we vote for Independence. Now as a Scot you might think I’d be upset about this, but if we vote for Independence as of September 18th then why would we need to vote in UK elections? Here’s a thought thought: What if those ‘Senior Conservatives’ were persuaded to publicly back independence with a currency union? Why would they do that? They know that the Scots will never vote for the Conservatives, so they lose the Scottish SNP and Labour voters who could make the difference between an outright Tory win and another coalition government. Fair swap? Come on English Conservative voters, convince your MP’s to join the YES campaign and everybody wins!